A journey to the temples of Angkor near Siem Reap, Cambodia, is a pilgrimage to one of the greatest sacred cities of the ancient world. 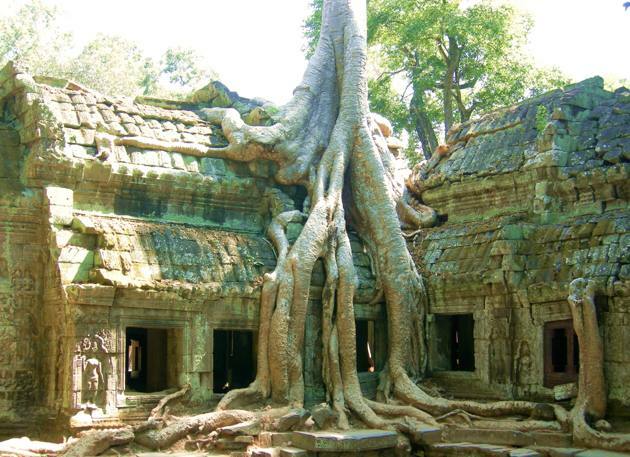 This UNESCO World Heritage Site consists of more than 200 temples built by the Khmer between the 9th and 15th centuries, surrounded by symbolic sculptures and temple-hugging trees still growing wild in the jungles. 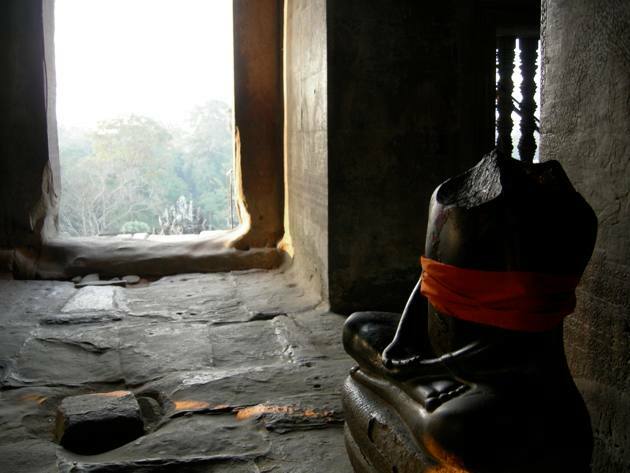 There’s so much light to be found at Angkor literally and metaphorically, despite Cambodia’s dark past. You can feel the presence of beauty in the shifting light that highlights different parts of the temples at different times of day. There’s a graceful feminine energy that quiets the mind, especially in the temples’ deserted corners, under the gaze of smiling, dancing goddesses called apsaras carved on the centuries-old stones. To be in the footsteps of monks and devotees who’ve prayed at the temples for centuries is to find calm, serenity, and stillness that exist deep in the soul. You’re in another world as you go deeper into Angkor. Mysterious and imposing, the main temple of Angkor Wat evokes melancholy, its lonely corridors an appropriate site to ponder life’s mysteries. Magnificent bas-reliefs depicting gods and demons of Hindu mythology and headless statues of Buddha in the lower level galleries are a reminder that the kingdom was once devoted to Hinduism before it converted into Buddhism. A few minutes away from Angkor Wat, discover a temple complex in the walled city of Angkor Thom that was bigger than ancient Rome in its heyday. Once you pass the line-up of gods and demons at the gates, be prepared for awe and astonishment as you climb up the steps of Bayon. 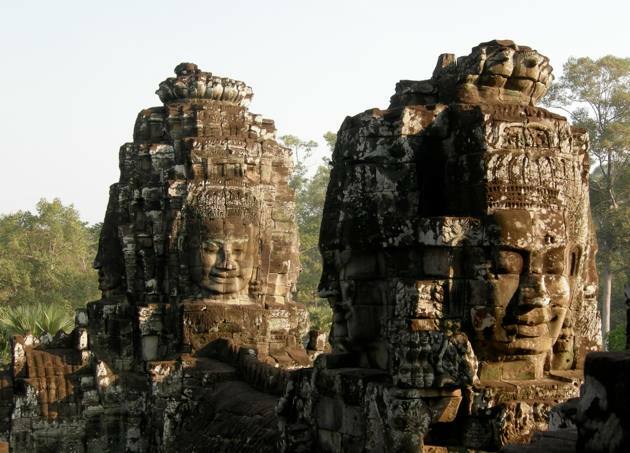 You’ll see one, then three, and then eight, and many more giant, enigmatic faces of Khmer King Jayavarman VII as a Bodhisattva smiling down at you. Best visited in the early morning and late afternoon when the light illuminates the sculptures with a warm glow, Bayon is the most breathtaking temple of Angkor. The quiet Buddhist monastery Preah Khan is off the major tourist path. Its endless corridors and moss-covered walls - whose colors morph into differing shades of pink and green depending on the light and time of day – have inspired and captivated many photographers. Angkor brings out a sense of adventure with its ancient ruins, mysterious passages, lush jungle trees, false doors, and steep steps. I was transported to another world, into an unforgettable adventure as I walked into the jungle-temple, crumbling buildings and gnarling trees of Ta Prohm, the most dramatic temple of Angkor that was featured in the movie Tomb Raider. Thick tree trunks and wildly grown roots, crushing and gripping the structures, are nature and spirit not letting go, connected to each other. A guard gestured at me to follow him while I was taking pictures at Ta Prohm. Intrigued, I followed as he took off a few “do not enter” signs to get into forbidden corners. The crowd of tourists and their voices faded away as we got farther and higher up the temple’s roofs, climbing up walls and jumping off stones, with the guard showing me scenes after scenes of gnarled roots, overgrown trees, devastation, and lovely carvings of apsaras hidden in shadowy corners. The guard disappeared as soon as he led me back into the crowd. There’s no better way to rejuvenate a tired body after a morning of climbing steep, narrow stairs than spending a few hours in the afternoon at the spa. Daytime spas are easy to find in Siem Reap, a small town where everything is within a few minutes tuk-tuk ride. There are plenty of accommodation options, ranging from modest $20 per night guesthouses to the ultimate in luxury such as the Amansara, which offers blissful spa treatments, yoga, and meditation. Cambodia’s proximity to its neighboring country of Thailand results in a spa culture heavily influenced by Thai-style massages, blended with Cambodia’s own Khmer style. 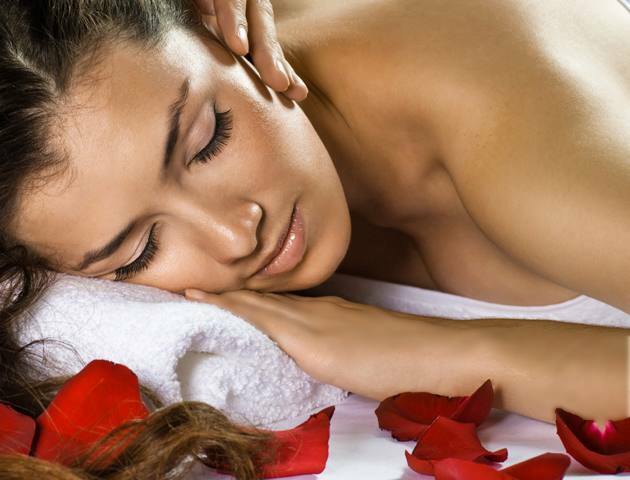 My favorite, Frangipani Spa, is an intimate, inexpensive and friendly spa that feels like a welcoming retreat after a day of being out and about in the sweltering sun. Frangipani’s foot massage is blissfully relaxing and the perfect end to a day spent at the temples.